The Barbarian chariot is done, can I get a witness? So the original archer is pinned to be swappable with Red Sonja here. I also made a base for everone who is not currently in the chariot to hang out in. Hopefully I'll get this chariot photgraphed properly tomorrow, now that it's done. Also doing a few quick Frenchmen with ludicrous hats (below) for a friend since things have been Napoleonic around here last week. I've been informed these buttons should be more pewter. Oh well. He was fun to paint, but I can't imagine painting napoleonics all the time. I'd go mad. Oh, got back to the barbarian chariot too and the horses are done; the glue affixing them to the base is drying as I type. I finished this lass shortly after taking this. Final pictures will be a while in coming though- now to do the chariot and horses. Turns out a hairdryer is just the right amount of heat to get the resin pliable, but not droopy or dangerously maleable. Even halfway through the paintjob. Thanks to SJB for the suggestion! So now her spear is no longer swept backward. The CMON shop exceeded expectations (not hard to do) and delivered SJB's latest barbarian lady in time to include her in this project, which I wasn't sure if I'd be able to do or not. I re-drilled the chariot frame to accomodate either the bowman or her scantily-clad spear throwing self, depending on preference for game utility. Seeing as her sculpting is better and more uptodate, she's getting a little better treatment than the boys with the brush, but I'm still moving along at a good pace. These are nearly done, and so is the chariot. Test fit the orcs tonight... For what I had intended to be a 'quickie project', I think this is going to end up looking pretty decent, if I do say so myself. Shown in the patrol uniform of the 69th Infantry Regiment. "The Felchers". Limited Ed. fig sculpted by the amazingly talented Shane Hoyle for participants of the FU!UK Salute 08 game. I did sort of a rush job, but I just wanted something fun and quick to get him on my shelf so I can keep on keepin' on otherwise. . . .the time of the orc is at hand. #2: Did a slightly differrent skin tone here, more yellow ochre at the end rather than ivory. the time of men is at an end. Orc diversion #1 & 2 are finished. unspeakable things are happening at Madponies. ORCS have been seen on the painting bench! Don't worry, it'll all be back to normal before too long. Cabin Boy (with no chance of promotion). He'll be swabbing the decks for all time! Random chaos thug. A coworker got it as a freebie from his warhammer online account and doesn't do lead, so he thought he was being nice by giving it to me. I don't want it, and likely would never source any conversions from it, so I painted it and am giving it back to him. That'll learn him! (punchline to a great pirate joke). Anyway, I took a week off for a motorcycle ride, and then a few more days to get back into the painting groove, but here I am. Made a little progress on the this group. 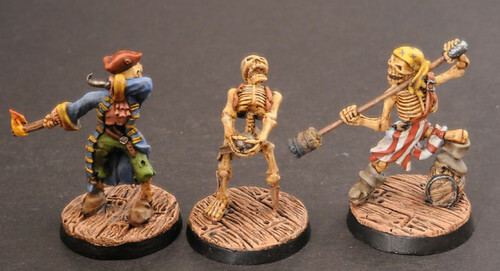 I'll enjoy these last three, but I'm definately ready to be done with the skellies. I'm off for a week. No painting, no job, not much at all. Just my motorcycle, sunshine, and the twistiest roads between Seattle and Western Montana for the next 6 days. I had a great time with this smooth operator from Mountain Miniatures. He's also for sale on ebay presently. Been out in the woods for a few days so not much painting, but I finished this one after work today. Still finisihing up the bases. English ( / Welsh conscript) bowmen, and their captain Sir William Samson. c1290s.